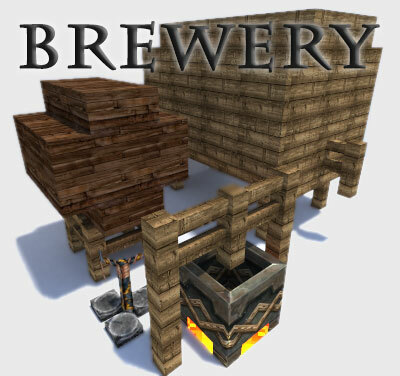 Brewery is a Plugin for an alternate brewing process, including alcoholic Potions. This Plugin works with Craftbukkit and Spigot 1.13.x, 1.12.x, 1.11.x, 1.10.x, 1.9.x, 1.8.x, 1.7.x, 1.6.x and probably lower. The somewhat difficult brewing process rewards you with a diversity of Potions, which, through their effects, create a drunkeness that has never existed in Minecraft before. Learn the art of brewing through fermenting, distilling and barrel aging on your Minecraft server. Experience how, from spring water and wheat, through hard work, a cool beer is created. Distill high-proof liquor, which gets that unique taste after some aging in oak barrels. Celebrate the biggest feasts you can imagine and always keep the cheerful athmosphere. Fill the taverns with laughter and loud music, while the drunkards scuffle on the streets. Check the Wiki for more Information on how to install and use Brewery. Das Plugin ist auf Deutsch entwickelt worden, ist aber standardmäßig auf Englisch. Das Wiki ist auch komplett auf deutsch, schaut dort für mehr Informationen! By Default, the Plugin is in english language and config. It is highly advised to use the config and language file for your language, as some parts of the plugin (like the Chat distortion) are language specific. Config and Language files are included with the Plugin and can be found in the Brewery folder after first run. Simply replace the generated config with one from the "configs" folder. Which language file to use is set in the config. After installing you can simply start brewing, by fermenting ingredients, distilling and aging the ingredients. Check the Wiki for detailled informations about the process of brewing. To also take advantage of the more advanced features, you may want to have a look at the config, where you can create your own recipes and even alter the word replacements in chat when a player is drunk. By default there are just some basic recipes, that show what settings you can utilize. There are plenty more possibilities to create own recipes such as Gin, Whiskey, etc. You may want to look around on the internet about how the Drinks are made, or create fantasy recipes with funny effects and ingredients. Most of the good Drinks should be kept secret or have just vague descriptions on how to brew them. That allows players to try around on specific ingredients, so that only certain brewers master the creation of a high quality drinks. When it comes to drinking, it is nice to define Wakeup Points. These are places in the World where players "wake up" when they log off for a period of time while drunk. These places may be anything like high on a tree, inside a cave, on towers, on small islands or in astonishing buildings. Feel free to drop a comment below! Suggestions and bug reports are highly welcome. Also if you have found a bug you may want to create a ticket or a pull request. You can also pm me if the bug is critical and could be exploited if it would be made public. Why does this plugin doesn't work anymore..? Any chance there could be a forge port for it? In case you can't/won't make a port, can I get the permission to get it ported? If there are any details about something like that you'd need to discuss please don't hesitate to send me a pm. Have you considered adding in the ability to use negative levels for the status effects? It'd be very interesting to have a beverage which gives you negative absorption levels. Hi, I'm running this off a server based off my PC, and I'm having config issues. I meticulously add new recipes off the same format as the example, but the new recipes do not register. As well, previous recipes that work (like the default vodka, etc) don't work if i edit the config.yml in any manner. Is there something I might be missing? Hello there :) Will this plugin be updated to 1.13 version? I have tested it on 1.13-pre7 and it is totally broken. Please let us know! :) I am willing to donate to continuate this plugin. Aww i miss this plugin. But i only see 1.10. for the download. Im on 1.12.2. I hope it will be updated one day. This plugin works fine with 1.12.2.
im having trouble creating a custom recipe, any tips?? Since potions have a tag for custom colors using decimal codes (CustomPotionColor:16777215 would be white) maybe you could add the ability to use decimal codes for the color instead of the preset color choices? how hard would it be to make this a 1.11.2 plugin? could I run an older version just change the item id's to match? please please please this plugin is one of my top 3 plugins and mandatory for any server I host/jump onto. This plugin should work perfectly fine with 1.11.2. If you experience any issues please report them! A shop feature would be amazing. For instance, if Bob1 had a 5 Fine Beers, he would be able to sell them all to a Fine Beer shop. As far as I know, it is not currently possible as every brew a player makes has a seperate ID and therefore cannot be sold to a Shopkeeper or Chest Shop unless the ID is the exact same as one of those brews. On 1.9.4 using Brewery 1.5, the colors of many drinks seem to be incorrect. The only colors that work seem to be pink, orange, red, and dark red. All other drinks seem to be assigning these colors over whatever ones are specified. Is this a known bug? Is there a known fix? Can you write this mod for forge 1.10.2? Very good plugin, can I transfer to www.mcbbs.net? Sure, it's licensed under GPLv3.